The teams travel from New Zealand to Cambodia on the fifth leg of the race. *Sure, the highlight today should have been the magnificent visit to Angkor Wat, but I'll be the first to admit I was a little obsessed with the filming of a certain, unnamed reality show that airs on Tuesday nights on CBS, that features pairs of people adventuring on a global scavenger hunt. *I think you catch my drift. I even got filmed helping one of the contestants find her clue and signed my life away to CBS, or at least signed away any shot of royalities from a brief glimpse of fame! *We'll definitely be watching when the new season starts to see if we can spot ourselves in the "travel documentary" that two of the contestants said they were in. *........while I made my way to Siem Reap, by boat . Wise choice. The water is low, but we only got snagged a few times, making it here in about six hours. I've really enjoyed boat travel in SE Asia so I was glad to have one more opportunity before leaving this part of the world. *We also witnessed upon arrival what appeared to be a segment being filmed for Amazing Race. *It was an African American couple. I just uploaded the only pick I have to my blog entry "cambodia's culinary delights." It's the last picture in the series. *I saw them after arriving near seim reap by boat from battambang, traveling through lake tonle sap. It was about 2:30 or 3 in the afternoon on a Sunday. *They were at the water's edge. We were kept away but I saw the guy stacking some baskets I've seen them use to transport pigs and she was holding their bags. *They then jumped in awaiting trucks and were transported with the cameraman and got out near a wat outside of town. I kept onto town so I don't know what happened next. *"an African American couple down by the dock, and she was holding their backpacks and he was stacking baskets and then they jumped in the back of a waiting truck and off they went. They kept filming them while in the back of the truck, and then they got out and were heading up to a wat I think"
*Yes ! they are definitely contestants from the Amazing Race Show. *We were at Tonle Sap Lake and saw route markers (Flags in red and yellow) on 6 boats at the pier. *There were camera crew but we did not see the contestants. Very exciting ! Blog per Slowhatch They were in Angkor Wat the same time as my group, so if you happen to see that episode, you might see one of the Cambodian guys in my group helping him find the clue (look for people in a bright green t). Chateau d if:This shot was taken here between 11:24 and 11:32 am (asumes May 4th). *We were at Angkor Wat on the 4th May when they were filming the Amazing Race. *I was checking the time stamp on my photos from Angkor Wat and from 11.30 - 12.30pm that was the only team that came through. *Just for curiosity sake the guy with the orange hair was really nice and managed to exchange a few words. *Come to think of it there would have been another team there but they were leaving at 11.30. Thats what got my attention in the first place..the camera crew running outside. I couldn't tell you who it was though. But im positive the team i saw was the only one there from 11.30 because the guy with the brown hair was the only person waiting while his team mate was doing the road block. *The blogger said 6, but I count 7 flags there (the flags on each end are almost hidden--compare my arrows below to the original). *To finish the day we have seen the sunset in the main temple of Angkor Wat and which it has been our surprise that we have found ourselves to the presenter of our favorite program of the TV (Amazing Race). It results that they are preparing the next season of the program from deal about a gymkhana of the world and the winner being carried by that going round a prize of a million dolars! Has been very curious the encounter and we have been able to speak a little with the presenter and the equipment of the program (the very charming and nice people truth). A day with an unexpected end!!!! Phnom Penh is the capital of Cambodia and it’s a 6-hour bus ride from Siem Reap. We were hoping to take the Mekong Express bus or plane going there but both were fully booked so we ended up taking a regular airconditioned bus which turned out to be a blessing in disguise because we chanced upon the shoot of Amazing Race right across where our bus was parked! :) Photo-taking isn't actually allowed but we were able to snap some shots from the bus. This shot was taken between 8:13 and 9:16 am (assumes May 4th). We didn't manage to take a picture of it but i think we ran into a couple doing the Amazing Race here. We'll have to check out the next season but the couple was being followed by a camera man and they had to find a specific face in the ruins. I did my best to make a cameo between this and Bollywood I am really getting my face out there. can you delete my other thread puddin?! If I can stop laughing long enough Michael, OMG this is why we love you! I can't believe how much is already here... you guys are AMAZING!!!! If Marissa & Brooke (as I suspect) are eliminated in the previous leg, I guess this is where Aja & Ty get knocked out -- if this is an elimination leg. Too bad, but at least Kelly & Christy survive. 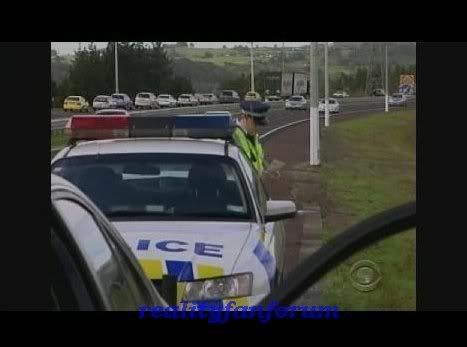 So all we get is the Auckland Highway patrol and a travel agency?? The gas task (if it is a task) is quite common in Cambodia; people either crank portable pumps or pour it out of old Johnnie Walker/soda bottles. If the above is accurate(which I believe), then the last group will be about 5 hours 20 minutes behind. Unless there is an hours of operation in the Siem Reap/Angkor Wat area, they will probably be eliminated there unless saved by a NEL. Here's the long preview on Youtube. Thanks to Dreamer. "Do It Like A Madman" - One Team finds itself in trouble with the law as they watch precious time tick away, while another Racer doesn't hesitate to lie while standing in one of the most religious places on earth, on THE AMAZING RACE 13, Sunday, Oct. 26 (8:00-9:00 PM, ET/PT) on the CBS Television Network. This shot was taken here between 7:32 and 8:13 am (assumes May 4th). Obviously the team that's in trouble with the law is Terence & Sarah while I'm willing to be that the Racer who doesn't hesitate to lie is Nick. He & Starr have been portrayed as sneaky in at least one episode and in their interview with Reality News Online, Mark & Bill said that Kelly & Christy probably blamed Nick & Starr for the sports bra incident because the brother & sister were seen as sneaky -- which is what I believed. So Nick (& Starr) will be burning bridges with more teams than just Kelly & Christy. Auckland airport Flight Centre photo. If Starr falsely accused Terence of stealing Nick's bag when he had it with him the whole time, then it's more proof that Nick's the one who burns bridges with the other teams. I don't mind being conniving if you really need to be (like not helping others out when you're near the back of the pack and could be eliminated), but Nick & Starr are taking it too far. No wonder Kelly & Christy mistakenly accused Starr of throwing Christy's sports bra off the ledge (even though I doubt Starr would do so because she'd get nothing out of it)! You know that Chateau is completely right on this but that brings up another issue. Terence and Sarah should never have had the opportunity to beg for or be offered $500 nor should any other racer. Notice that they are not showing those activities on the normal episode because World Race Productions and CBS know how their audience feels on this issue. Begging and accepting gifts should be banned, as driving over the speed limit. These activities demean the Amazing Race because they take away the level playing field essential to a good race! In other TAR seasons, they seems to emphasize driving the speed limit. Do we know how much time it costs them? At the beginning of the leg it is not that costly if they make the flight ... which other information show that they do make the flight.